1 of 4 In a small bowl, whisk together the mayonnaise, red wine vinegar, sugar, salt and pepper. Set aside. 2 of 4 Heat a medium-size pot of water to boiling and a large skillet of water to simmering. Add broccoli to boiling water and cook 3 minutes, until tender but still crisp. Drain. Meanwhile, add turkey to skillet of simmering water and poach for 3 to 4 minutes or until cooked through. Remove to a cutting board and cool. 3 of 4 While broccoli and turkey cool, stack bacon slices on a paper-towel-lined plate (about 5 slices per layer; paper towels between each layer). Microwave on HIGH for 7 minutes, checking and removing any crisp slices after 5 minutes. Cool slightly, then crumble. 4 of 4 Cut turkey into bite-size pieces, then transfer to a large bowl. 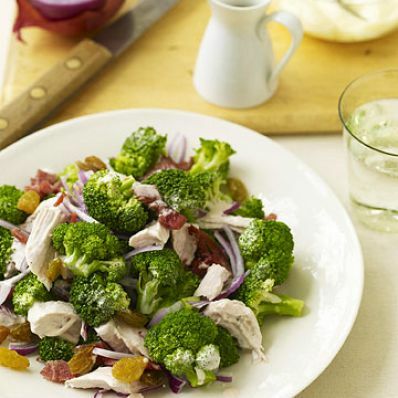 Add broccoli, bacon, red onion and raisins. Toss with mayonnaise mixture until combined. Serve or refrigerate until serving.